When scanning a document with the Scan Snap Evernote Edition scanner I get the following errormessage from Scansnap Manager Evernote Edition. 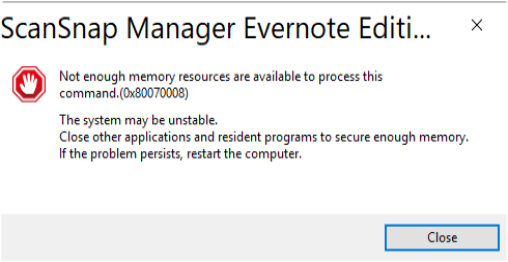 It displays this errormessage and the document is not added to Evernote. New Windows 10 English installation. Latest Evernote. Latest Scansnap Manager. Installation of all was successfull without any problems. When I open my ScanSnap it is seen by the Scansnap Manager software. It just does not add scanned documents to Evernote anymore when I scan a document with the Scanscap. It should just work but it does not. and login I am logged out both in Firefox and Edge. I just want to sent evernote support an email but it is not possible to get an e-mail adres or to get to a submit ticket form. It must be very quit at Evernote support. How do you contact Evernote support?. It just does not add scanned documents to Evernote anymore when I scan a document with the Scanscap. It should just work but it does not. Can you successfully scan in a document using a different ScanSnap profile than the Evernote one? I'm assuming the Evernote Edition version of the scanner does include other, non-EN profiles. Just wondering if it is a general scan issue, or something unique to the Evernote firmware/profile. There is no way to contact Evernote support for me. I only I had their e-mail adres. I am a premium Evernote User since 2010. @s2sailor There are no non-EN profiles as far as I know. It should scan directly into Evernote via the piece of software which was successfully installed called Scansnap Manager Evernote Edition which has document types for Documents, Business Cards, Receipts, Photo's. It used to work fine under windows 7. But with windows 10 I get the error of Scansnap Manager Evernote Edition crashing mentioned above and nothing is stored anywhere. Also the Evernote Log does not show anything after the error. Evernote was never called. The scanner is correctly working according to the Windows 10 Device Manager. See image. Hmmm ok, it sounds like the Evernote brand scanner comes with customized ScanSnap manager software. Have you tried reaching out to Evernote on Twitter? Yes, now through facebook. I am talking to support for already a month. They are just not getting that there must be a bug in the ScanSnap Manager branded version which prevents the Scanner from working with windows 10. The version of Fujitsu of the ScanSnap Manager is version 6.3 or later which should work with windows 10. I have version V1.5L10 (1001) of ScanSnap Manager software made by Evernote which does not work with Windows 10 pro 1809. I have tried with a laptop and a PC with windows 10 both give the error. So it's not a problem with the memory on one computer since it fails on two totally different machines and both machines have enough memory and we tried killing all other tasks but that makes not difference. Hello, I run a standard ix500 with ScanSnapManager myself. No problems at all with Win10 ... even when updating (although my thumbs are always deep-blue from pressing them hard before I allow the next update to enter). Is it possible to switch to the standard version of the scanner (maybe by updating the firmware) and the software ? The standard ix works just fine with importing to EN.